Sit back... relax... and enjoy your flight! Feel the freedom of flying in the blue sky! Two or three people can fly at a time. Our friendly and experienced captain and crew will do all the work to ensure your comfort and safety. One round of parasailing for 2 persons (7-10 min, depends on the weather), Fly board for 1 person (15 min), 1 Jet ski for 2 persons (15 min). Transfer is included. Our specialized parasailing boat offers you a unique experience of Koh Samui. At the first glance it looks like water skiing, but here parachute is used instead of skis, it is attached to the boat with the help of special equipment. 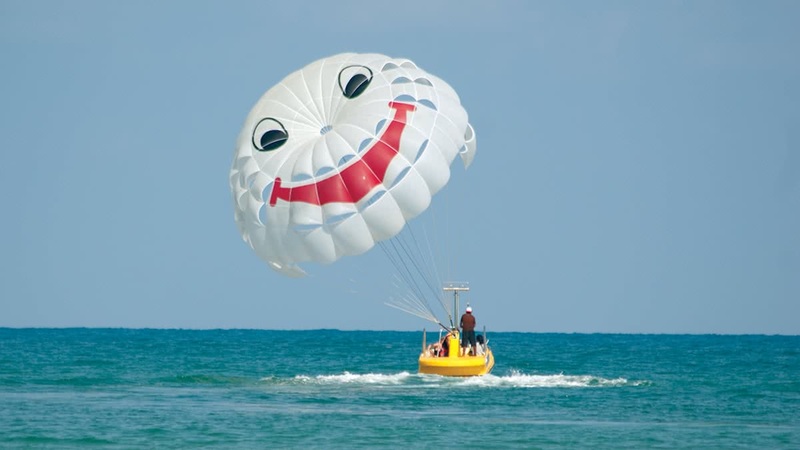 Parasailing is a very beautiful, interesting and exciting entertainment. It is suitable for both novice skydivers who, for whatever reason can not make the first parachute jump from a great height, as well as for leisure travelers who want to diversify your vacation travel. If you are afraid to jump from a regular parachute, but the dream of flight does not leave you, parasailing is what you need. While rising to a height you will feel an unforgettable experience. You will see views of the surrounding area for many kilometers around. You will feel the conqueror of height and space. Parasailing is very tranquil and peaceful. Take-off’s and landings are very slow and gentle making you feel as if you are truly “floating on air”.